10 Bathroom Items You Need to Ditch Immediately. Has your minimalist journey got you wondering which bathroom items to keep and which ones to ditch? Some bathroom items are a no-brainer, like hair ties whose elastic days are well behind them, but what about everything else? Continuing the 10 item theme (wardrobe & life), here are 10 bathroom items to ditch immediately, including some you really need to! And, as added incentive to get this job done, apparently the state of our bathrooms says a lot about us, not all of it good! So if you haven’t given your bathroom an overhaul yet, now is the time. Whether it’s prescription or over the counter medication, it has a use-by date. Check yours to ensure you’re not wasting valuable space on medications that are no longer viable. And, while you’re at it, find a new (and secure) home for your medicines. The bathroom, with fluctuating temperatures and humidity, is the worst place to keep your medicines and first aid items. NOTE: Dispose of expired medication by taking it to a pharmacy. No medications should ever be put in the bin or down the drain. Unfortunately, nothing lasts forever, including your cosmetics. Despite their pretty packaging and their price tags, cosmetics have an expiry date that’s probably closer than you realise. Check out the infographic to see if you need to ditch any of the cosmetics in your makeup kit. Anything that can’t be put through a hot wash in your washing machine probably has no place in your bathroom in the first place but even some items that can, especially those with a firm structure and lots of hiding spots for mould and bacteria, need to be ditched regularly. Instead, get yourself a supply of microfibre wash cloths and launder regularly. Years ago I used to travel extensively for work. That meant lots of hotels. And, what is the one souvenir most of us can’t resist? The freebie bathroom products. I still have a collection that dates back to when my daughter was little. That’s more years than I care to admit. It’s a given that every single one of those products is so far out of date that using the products is out of the question. If you’re like me and have a similar collection of hotel bathroom items picked up over the years, it’s time to ditch them. We all like to get value for money, true. However, there comes a time when all towels need to be retired to the rag bag. Better still, send them off to the local animal shelter where they can see a more use before finding their way into landfill. Useful bathroom item: suction cup soap dish. This one is mostly about the cleaning aspect. Soap dishes soon build up a cement-like residue of soap scum which makes them look unsightly and impossible to clean. Use a liquid soap dispenser by your hand basin and, if you prefer bar soap in the shower, get a suction cup soap dish . Regardless of how clean the rest of your bathroom is, if the shower curtain looks mouldy, mildewy or scummy in any way, it makes the whole room look dirty. Shower curtains are reasonably inexpensive so if yours looks like it’s beyond help, take it down and get a new one. Make sure to wash your shower curtain once a month by throwing it in the wash with the towels, which will give the curtain a bit of a scrub during the wash cycle. If the elasticity has gone, the hair tie should be, too. Any hair accessory that isn’t in perfect condition, like rusty or sharp edged bobby pins, should follow the dead hair ties into the bin. If your toothbrush looks like it’s been run over by a bus, you probably should have replaced it ages ago! Ditch it right now and go grab a new one. A mangled toothbrush is more likely to damage your teeth than clean them so you think you’re saving money, but it might cost you more in dentist bills later. The general guideline is to replace your toothbrush every 3 – 4 months. So, to keep things simple, change your toothbrush with the change of season. If the bottles are almost empty because you use the product every day, that’s fine. But if they’ve been hanging around the hand basin or shower stall for weeks, or months… get rid of them now. Chances are they are past their use-by date or, you don’t actually like the product. On the off chance it hasn’t been used up because you forgot about it, resolve to use it as a priority. How’d you go? Did you have something in all 10 categories to throw away? 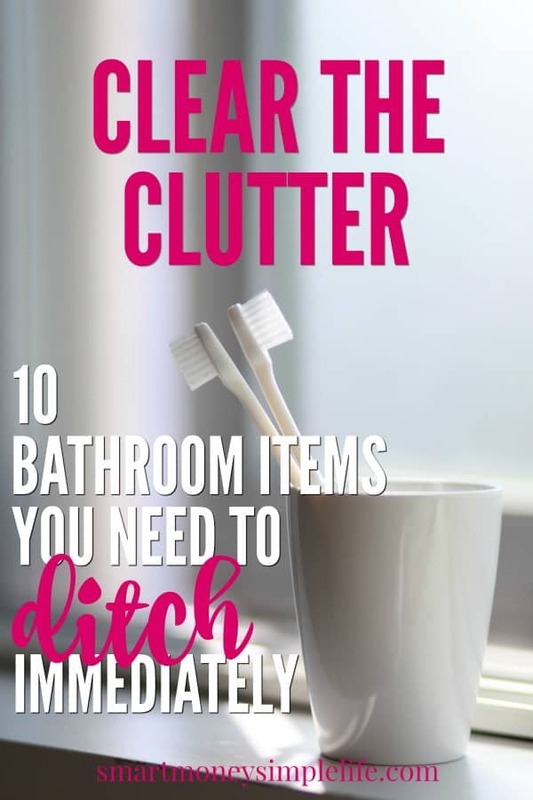 Now that you’ve cleared out the clutter from your bathroom, the trick is to keep it looking clutter-free and clean. Keep on top of things by regularly checking this 10 items to ditch list.